WASHINGTON, D.C. — The annulment committee formed by the World Bank’s International Centre for the Settlement of Investment Disputes ("ICSID") has ruled that Venezuela must pay oil services company Tidewater (NYSE: TDW) $37 million for the expropriation of its ships and rigs in 2009. The committee did annul another $10 million part of the award. The panel "upholds the adjudication of US$16.4 million for accounts receivable and US$19.997 million for the loss of business value, totaling US$36.397 million. At the same time, the Committee annuls a portion of the Award and the amount attached to this portion, i.e. US$10.003 million, and extinguishes the res iudicata to that extent," the three member panel ruled. "It will be for a new tribunal to render an award with respect to this portion for which the Tribunal has failed to state reasons." successful in having the award recognized and entered on March 16, 2015 as a final judgment by the United States District Court for the Southern District of New York. However, the company recognizes that the collection of the award may present significant practical challenges," the company reported on March 1st. Tidewater announced in May of 2009 that Venezuela had seized 11 of its vessels, in addition to the $40 million Venezuela’s state owned oil company owed the company. The company said at the time that the boats and facility nationalized by Venezuela had a book value of $2.8 million. On February 8, 2013, the tribunal issued a decision on jurisdiction and found that it had jurisdiction over the claims under the Bilateral Investment Treaty, including the claim for compensation for the expropriation of Tidewater’s principal operating subsidiary, but that it did not have jurisdiction based on Venezuela’s investment law. The practical effect of the tribunal’s decision was to exclude from the ICSID arbitration proceeding the Claimants’ claims for expropriation of the fifteen vessels. While ICSID determined that it did not have jurisdiction over the claim for the seizure of the fifteen vessels, Tidewater received during fiscal 2011 insurance proceeds for the insured value of those vessels (less an additional premium payment triggered by those proceeds). Venezuela accounted for $60 million the company’s $1.4 billion in sales in 2008. 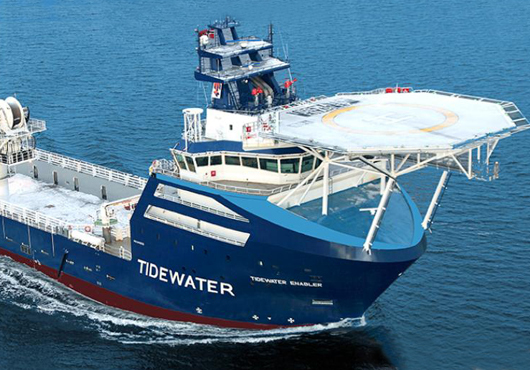 Tidewater is one of the leading providers of Offshore Service Vessels (OSVs) to the global energy industry. They provide offshore supply vessels and marine support services to the offshore energy exploration, development and production industry. The company tows and anchor-handles mobile drilling rigs and equipment, transport supplies and personnel, and supports pipe laying and other offshore construction activities. The company reported profits of $140 million on revenue of $1.44 billion in 2014.